A. ZR75-1 (AR+, ER+) and B. MDA MB 231 (AR-, TNBC) cells were treated with either abiraterone or vehicle, then used as targets in a CTL assay using CEA-specific CD8+ T cells as effector cells at an E:T ratio of 30:1. Error bars indicate mean ± S.E.M. for quadruplicate measurements. Statistical analyses were done by Student's t-test, * = P < 0.01 vs. vehicle control. Data are representative of 2 independent experiments. (A) KMS11 and (B) L363 cells were plated in 5mM glucose medium with ritonavir or DMSO (D) for 17 hours. Glucose consumption rates are normalized to untreated cells (not shown). (C) KMS11 and (D) L363 cells were treated with ritonavir or DMSO for 72 hours. Relative viable cell numbers were determined by MTS assay and normalized to untreated cells (not shown). Comparative mean±SD plasma concentration versus time curves of 40mg/kg oral posaconazole (PSZ) administrated in normolipidemic (NL), intermediate hyperlipidemic (IHL) or extreme hyperlipidemic (HL) rat groups. An insert showing a clear snap of the plasma concentrations for the first 7 h.
Voriconazole increases the osteogenic activity of human osteoblasts in vitro. Osteoblasts were exposed to voriconazole (VCZ) or fluconazole (FCZ) at 15 or 200 μg/ml in osteoinductive medium (OS+) for up to 7 days. As a positive control, cells were also exposed to sodium fluoride (NaF) at 10 μM in nonosteoinductive medium (OS−). Osteoblastic differentiation was evaluated by measuring alkaline phosphatase (ALP) activity (A) and staining for calcium deposition with alazarin red S stain (B and C); calcium deposition was quantified by measuring the absorbance (A415) of extracted alazarin red S (B) and was assessed by the light microscopic appearance (white arrows) of stained osteoblast cultures (C). Values represent the means ± SD. *, P < 0.05, compared to osteoblasts grown under osteogenic conditions without treatment. Acetylshikonin is a biologically active compound with anti-cancer and anti-inflammatory activity, which is isolated from the roots of Lithospermum erythrorhizoma. It is a novel general P450 inhibitor with IC50 values of 1.4-4.0 μM for all tested P450s. Rhapontigenin, produced from rhapontin isolated from a methanol extract of Rheum undulatum roots by enzymatic transformation, is a selective inactivator of cytochrome P450 1A1 (IC50 = 400 nM). 7-Hydroxyflavone is a potent inhibitor of CYP1A1 with a Ki value of 0.015 μM and exhibits 6-fold greater selectivity for CYP1A1 over CYP1A2. It also has excellent antioxidant properties and great potential to be applied as medicines. Stiripentol is a third-generation anti-epileptic drug that enhances GABAergic neurotransmission. It is an inhibitor of cytochrome P450. Galangin, a naturally occuring flavonoid found in herbs, is a well-known antioxidant and also an inhibitor of CYP1A1 activity and an agonist/antagonist of the aryl hydrocarbon receptor. Diallyl sulfide, a thioether found naturally in garlic, is a selective inhibitor and also a substrate of CYP2E1 with an IC50 of 17.3 μM. It has protective effects against alcohol- and acetaminophen-induced hepatotoxicity in many studies. a, b, Melanoma-bearing mice were treated with avasimibe (Ava) or DMSO control (5 times) (control, n=9; avasimibe, n=8). c-e, STORM analysis of TCR clustering of tumour-infiltrating CD8+ T cells. c, Representative images. d, Ripley’s K-function analysis of TCR molecules. e, The r value at the maximal L(r)-r value of Ripley’s K-function curves (control, n=100; avasimibe, n=85). 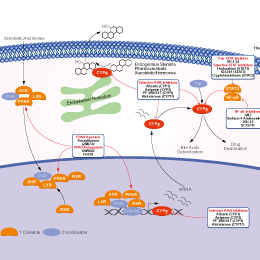 f, g, A combined therapy (avasimibe and anti-PD-1) or monotherapies (avasimibe or anti-PD-1) in treating melanoma (n=10). Avasimibe, 5 times; anti-PD-1, 4 times. h, i, Cytokine/granule productions of PD-1hi and PD-1lo tumour-infiltrating CD8+ T cells (control, n=12; avasimibe, n=11). Resistance to itraconazole in MA cells. The parental SUM149-Luc cell line and MA1 cells were treated in parallel with 1 mM itraconazole for 9 days (which killed most of the cells in the parental cell line) and were allowed to recover and grow in a drug-free medium for 5 days before being stained. Since itraconazole was ineffective in killing MA1 cells, the cells grew into a continuous monolayer rather than colonies. Effects of rifampin alone or in combination with cobicistat on the mean DRV CLint.app. in primary human hepatocytes in vitro. Cryopreserved primary human hepatocytes were incubated with RIF (0.5 to 20 μM) (hatched bars) or with COBI (0.13 to 12.76 μM) and RIF (0.5 to 20 μM) (gray bars) for 72 h. All cells were then incubated with RIF (0.5 to 20 M) or RIF (0.5 to 20 μM) together with COBI (0.13 to 12.76 μM), as described above, together with DRV (5 μM) for 60 min. Control cells were treated with DRV (5 μM) alone for 60 min (black bar). The results shown represent the mean DRV CLint.app. from three biological replicates measured in hepatocytes from three independent donors (donors HU1399, HU1574, and HU1587). Error bars indicate SDs. Primary hepatocytes were treated with or without 20μM Wy14643/Pioglitazone/Rosiglitazone for 24h followed by stimulation with or without 1μg/ml recombinant human FGF21 for 15min. FGF21 signaling was analyzed by phosphorylation of ERK1/2 and FRS2 examination. The effects of apigenin and GLUT-1 AS-ODNs on xenograft apoptosis (the second experiment), observed an under optical microscope (magnification, ×400), and the percentage of apoptotic cells in 100 cells per field was counted and used to calculate the mean apoptosis index (AI). AI, apoptotic index. Baicalein suppresses the viability of DU 145 and PC-3 cells. b DU145 cells and c PC-3 cells were treated with different concentrations of baicalein for 24, 48, and 72 h. Baicalein significantly inhibited the viability of both cell lines in a dose-and time-dependent manner. The results are presented as the means ± SD of three independent experiments and the corresponding standard error. *P<0.05; **P<0.01. (d) Antiviral activity of SZA on assembly and release. Huh7 cells were electroporated with JFH-1 RNA of HCV, followed by 4 h treatment of the indicated concentrations of SZA. At 48 h after electroporation, cells were subjected to three cycles of freeze and thaw to test the intracellular viral infectivity; supernatants of the electroporated cells were collected for the detection of extracellular viral infectivity. 100 μM naringenin was introduced as a positive control. Results are shown as relative HCV infectivity compared to DMSO treated group. Data shown as mean ± SD of three independent experiments. Gentiopicroside (GE), a naturally occurring iridoid glycoside, inhibits CYP2A6 and CYP2E1 with IC50 values of 21.8μg/ml and 594μg/ml, respectively in human liver microsomes, and dose not inhibit CYP2C9, CYP2D6, CYP1A2 or CYP3A4 activities. Sulfaphenazole is an inhibitor of CYP2C9 with Ki value of 0.3 μM and demonstrates at least 100-fold selectivity over other CYP450 isoforms (Ki values of 63 and 29 μM for CYP2C8 and CYP2C18, respectively, and no activity at CYP1A1, CYP1A2, CYP3A4, CYP2C19). Uniconazole is a plant growth regulator that functions by inhibiting cytochrome P450 707As (Ki = 68 nM), a family of enzymes that catabolize ABA. It suppress gibberellin and sterol biosynthesis. Piperine attenuates inflammation in the substantia nigra (SN) of the MPTP-treated brains. (A) Iba-1-immunostaining was performed on brain sections for microglia. Piperine alleviated microglia activating caused by MPTP. (B) Brain tissue was stained with the anti-interleukin-1β (IL-1β) antibody in the SN. MPTP notably increased the expression of IL-1β in the SN of the mice and the increase was partly blocked by piperine. (C) Western blot analysis of IL-1β expression in the SN. (D) Densitometric analysis of western blot analyses of IL-1β. Densitometry was measured by Quantity One 1-D analyze software (Universal Hood II; Bio-Rad Laboratories, Hercules, CA, USA). Values are presented as mean ± standard deviation, *P<0.05, compared to MPTP. U2OS cells were cultured with FAC for 24 hours, washed, followed by chelation with 2 chelators (DFO, DFX) -/+ lysosomal protease inhibitors (E-64d and PepstatinA) and analyzed as in panel A. DFX: Deferasirox.